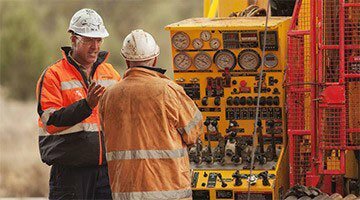 Mining Projects Group (ASX:MPJ) has just confirmed that its fully funded nickel drilling campaign is set to kick off in the coming days. The drilling is contained within MPJ’s strategic landholding, which sits on 40km of continuous strike, adjacent to the world class Kambalda nickel region – home to numerous high value nickel deposits already. MPJ are gunning to find the next one. MPJ has planned an initial drilling phase of 5,000m, with multiple well-defined targets to be drilled in relatively quick succession. Drilling will start at the Talc Lake Prospect in the coming days, before the rig moves on to test other key target areas including Roe 1 and 2, Point Perchance and Hooton. Any one of these prospects could be a game changer for MPJ – and as each of them are drilled into over the coming weeks and months, we will be finding out a lot more about their true potential. Now, MPJ is still a very small explorer, and success is no guarantee – such is the nature of minerals exploration. Working behind the scenes for MPJ to make this happen is a well-rounded technical team who carry decades of nickel exploration experience with them. All of them are taking equity in MPJ as they want to be part of the upside on discovery – read on for just how many big nickel finds they have been involved in. Most recently, the company has also recently added an internationally acclaimed komatiite nickel sulphide specialist, and ex CSIRO leader, Dr Robin Hill. His skills and experience should expedite MPJ’s nickel discovery mission. As you can see from the above map, the Roe Hills Project includes multiple nickel discovery targets, with all prospects lining up to create a 40km nickel sulphide strike zone. Of course there’s a of a lot of drilling that needs to take place before MPJ can say how long or how short any confirmed nickel mineralisation could extend to at the Roe Hills Project – and caution should be taken when considering MPJ as an investment. MPJ has already drilled a number of holes at Roe 1, Roe 2, Talc Lake, Hooton, Copter Cove, and Point Perchance and now it’s calmly and methodically moving its way north to see just how far the strike goes. In September, MPJ was away and drilling at its Roe 2 prospect, attempting to prove up nickel sulphide mineralisation. It did just that, proving that there is indeed a nickel sulphide mineralisation system there. Before the drilling, the Roe 2 prospect was defined by a hole drilled back in the 1990s. Assays from that hole came back at 8.6m @0.45% nickel, 0.2% copper from 241.4m depth. However, what MPJ wanted to do was drill 250m away to the south to see if the mineralisation extended or whether it was literally a one hit wonder. What MPJ found is that the mineralisation did extend. An assay on a diamond drill hole came back at 11m @ 0.45%Ni and 0.24% Cu from 113m depth. This more than likely means that MPJ has mass mineralisation on its hands. The latest round of drilling will not only prod into Roe 2, but four other high impact targets in quick succession. With that in mind, the next phase of drilling is set to get underway. Contractor DDH1 Drilling has advised MPJ that it is scheduled to commence mobilisation of a multi-purpose RC Diamond rig to the company’s Roe Hills nickel project, with drilling anticipated to commence early next week. The figure below shows exactly where the drilling will take place. 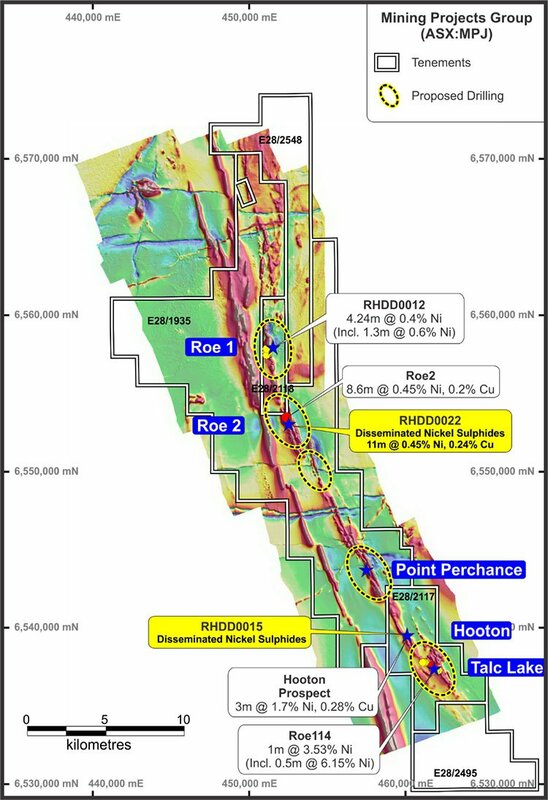 The initial phase of this round of drilling will take place at the Talc Lake prospect, located at the southern end of the 40km long ultramafic sequence at Roe Hills, before moving on to test other newly identified target areas to the north including Point Perchance, Roe 1 and Roe 2 and Hooton. Up to 5000m of RC and diamond drilling at the Roe Hills Project is planned before we wave goodbye to 2015. MPJ will test a series of priority targets identified by its highly experienced technical team. The first diamond hole at Talc Lake will clear out historical drill-hole ORTL9 in order to provide a platform for down-hole electromagnetic (DHEM) surveys to be undertaken to refine a strong off-hole DHEM conductor identified last year. The rig will then move on to test a strong DHEM conductor located along strike/down-plunge of previous holes RHDD004,RHDD005 and RHDD0006 (see image above), all of which intersected narrow zones of highly anomalous nickel (including 0.5m @ 0.4% Ni in RHDD004 and 4.0m @ 0.4% Ni including 0.6m @ 0.5% Ni in RHDD0006). The second diamond hole will be collared to intersect this DHEM target at a depth of approximately 260m down-hole. The rig will then move to the west to test a strong EM conductor identified recently as part of the surface Moving Loop EM (MLEM) surveys undertaken at Roe Hills. This MLEM conductor is located within a newly identified ultramafic sequence identified recently by the Company’s consultant geological and nickel sulphide specialist Sarah Dowling. As shown above, this sequence is located some 2-5km further west of the main sequence at Talc Lake and comprises a regionally continuous parallel belt of high MgO ultramafic rocks identified as part of a regional mapping project and confirmed by petrological evaluation. The initial phase of drilling at Talc Lake will take 2-3 weeks, with the rig then moving on to test other targets at Roe 1 and Roe 2, Point Perchance and Hooton. Fixed-loop EM (FLEM) and down-hole EM surveys are continuing across these other prospects, with data processing continuing. Once the information is collated it will be reviewed by MPJ’s geological team who will prioritise additional targets in coming weeks. MPJ has slowly but surely been building its very own experienced team of nickel sleuths. It’s done this by identifying the best of the best when it comes to nickel discovery experience. Now it has just added another superstar to the Roe Hills Project. Dr Robin Hill is a geoscientist who had a central role in discovering the Mt Keith, Emily Ann, and Maggie Hays nickel finds. He also led the CSIRO’s magmatic ore deposits group for more than 30 years, helping establish the geotechnical models which led to many of the nickel discoveries in WA over the last 20-odd years. Dr Hill literally wrote the book on nickel exploration in WA. “The project has many similarities to several of the world-class Komatiite massive nickel sulphide deposits in WA,” he said. This is a man who is considered a leader in his field. It is very unlikely he would be making this sort of bullish statement unless he really saw something he liked. Obviously he’s being paid by the company, but the ex-CSIRO man is unlikely to put his name to anything questionable. And he’s joining an already impressive technical line-up. Along with the likes of Neil Hutchinson, Steve Valance, and Sarah Dowling, MPJ has the team behind the Nova and Bollinger nickel discoveries which made Sirius Resources what it is today. Technical Director Neil Hutchison has over 20 years in mining and was formerly the Superintendent of the Cosmos Nickel Team. He also led the Poseidon Nickel team to develop the resource and reserve base at Mt Windarra, leading the team to a new Greenfield discovery named Cerberus. Technical Manager Steve Vallance is the forrmer Jubilee Mines Chief Geologist. In a career spanning over 25 years, Vallance has held senior roles at Xstrata, Jubilee Mines, Lion Ore/Forrestania Gold, Western Mining Corporation, Energia Minerals and Australian Consolidated Minerals and has taken projects from greenfield exploration through to successful mining operations. Komatiite specialist Sarah Dowling is a world renowned geoscientific specialist. With the CSIRO she helped develop and refine the geological models and exploration methodologies that have resulted in many of the nickel deposit discoveries in WA over the last 20 years. Dr Nigel Brand has worked as a geochemist within the mineral industry for over 24 years, initially with WMC Resources (11 years), Anglo American (5 years) and more recently with Geochemical Services (8 years). During this time Nigel has worked around the globe in diverse climatic and geological environments; from grassroots mineral exploration to geometallurgy in both ferrous and non‐ferrous commodities. And then there are Bill Amann and Adrian Black from geological consultancy Newexco who were not only behind the Nova and Bollinger discoveries, but also played a leading role in Panoramic Resources’ recent intersect of 89.3 metres at 1.6% nickel. Not to mention Peel Mining’s Mallee Bull polymetallic hit of 84 metres at 5% copper equivalent – as well as the famed Spotted Quoll and Flying Fox nickel deposits for Western Areas. With a crack technical team working feverishly behind the scenes to firm up the absolute nickel sweet spots at Roe Hills, this company will have as good a chance of hitting nickel mineralisation as any. However, at the same this is a small explorer – this is a speculative stock, and success is no guarantee. 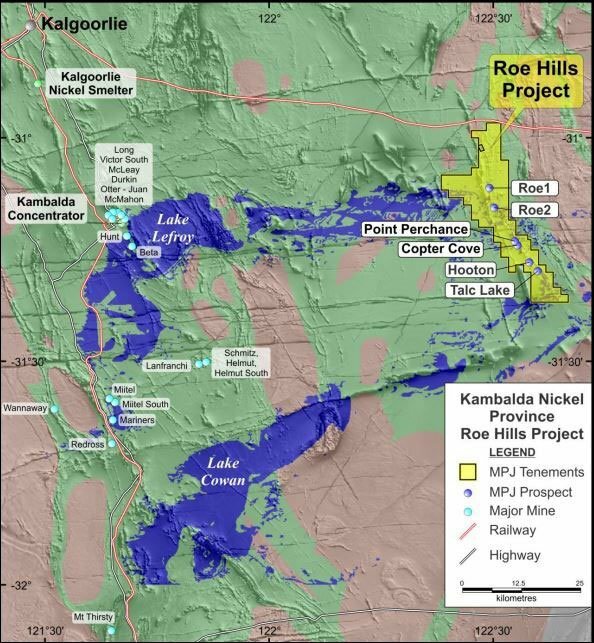 MPJ is attempting to prove up a 40km nickel strike adjacent to the world class Kambalda nickel region. In the coming days it will begin its 5000m diamond drilling programme on the back of previous positive drilling results and assays, holding the potential for an immediate uplift for the company, whilst building interest in the market over its 40km strike length potential. Behind the company is a crack technical team which has been made even stronger by the addition of CSIRO hot-shot Dr Robin Hill, who will be playing an integral role in telling MPJ where to drill. There is big potential here and next week’s drilling will act as a catalyst in either direction.